You will receive a digital print proof ASAP. The delivery dates mentioned are achievable when you approve the print proof before Saturday 18 May 08:00h. Remote areas can take longer. Do you need a specific date / sooner – please contact us. 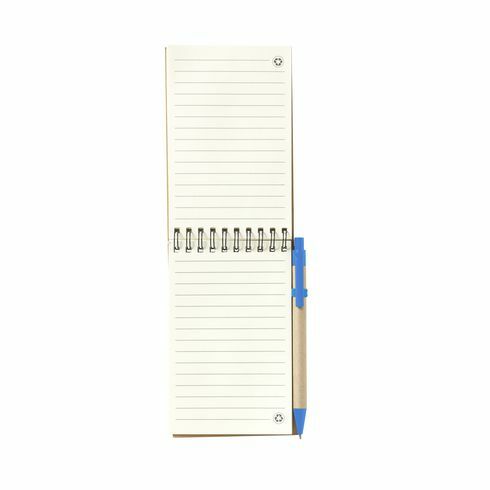 Environmentally friendly notebook made from recycled materials, with • approx. 70 sheets of cream lined paper • cardboard cover • strong spiral bound top • elastic closure. Includes matching blue ink ballpoint pen with cardboard holder.